Vail Nordic Center is located in East Vail at the Vail Golf course. Along with views of the Gore Range, there are 27 km of groomed trails for skate and classic Vail cross country skiing and more trails for snowshoeing. Another Nordic Center is located at Vail’s Golden Peak. The Vail Cross-Country Ski School‘s instructors specialize in cross-country skiing, telemark skiing, snowshoeing and skate skiing. Full day and private instruction is available. Beginners can be introduced to the sport on groomed terrain with a lesson at the Nordic Sports Center. Cross-country skiers enjoy 32 kilometers of groomed trails with spectacular views. Experience the peace and quiet of the backcountry and get some great exercise. Group and private lessons and tours are available at the Vail and Beaver Creek Nordic Centers. Full and half day programs are available. Telemark clinics are also regularly scheduled throughout the winter. The Vail Nordic Center in East Vail also offers classic and skate ski lessons as well as waxing clinics and women-only programs. Please call to arrange a lesson. Rental equipment is available at the Beaver Creek Nordic Center, located near the base of the Strawberry Park chairlift and the Beaver Creek Medical Center. Vail Nordic Center also rents a full array of skis, boots and snowshoes. 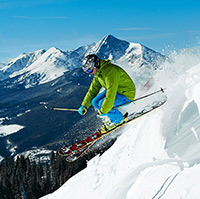 There are various types of skis, each designed for a different style of skiing. In addition, cross-country skis have either waxable or waxless bases. Check out the details below to find out what’s right for you. Track skis are designed for use at “Nordic Centers” where tracks are set in the snow. They are light, flexible, skinny, have no metal edges, and are usually waxless although waxable versions (racing skis) can be found. These skis are used in classic diagonal racing and for light touring. Skating skis are designed for the skating technique, similar to on-snow ice skating or on-line skating. These skis only use glide wax, not grip wax, and are never waxless. The skating technique allows racers to go must faster under most conditions. Skis are shorter and stiffer than track models with rounder tips. Waxless cross country skis have a “scaled” bottom so that they can slide forward and resist backward motion. These skis are a good choice for first-timers as they allow for concentration on one’s technique. They are not as good for going up steep hills or for unpacked powder snow. Waxable skis require waxing. With proper wax, waxable skis are faster than waxless on flat ground, and can be used to climb steep hills much more easily. The Vail Nordic Sports Center offers snowshoeing for all abilities. A guide will teach you about the area history, wildlife, and natural environment. Or, experience a moonlit snowshoe tour at night and enjoy the serenity of the Vail mountain under clear starry skies. Vail snowsheing is a favorite winter activity here. For more information visit the Vail Nordic Snowsports School at Golden Peak, call 970-754-3200, or for Moonlight Tours please contact your Vail Mountain Lodging Concierge.